The Gray Nicolls Kwik Cricket Bat has been designed as an alternative to traditional equipment to allow the game to be played safely on any flat surface either indoors or outdoors at any time of the year. 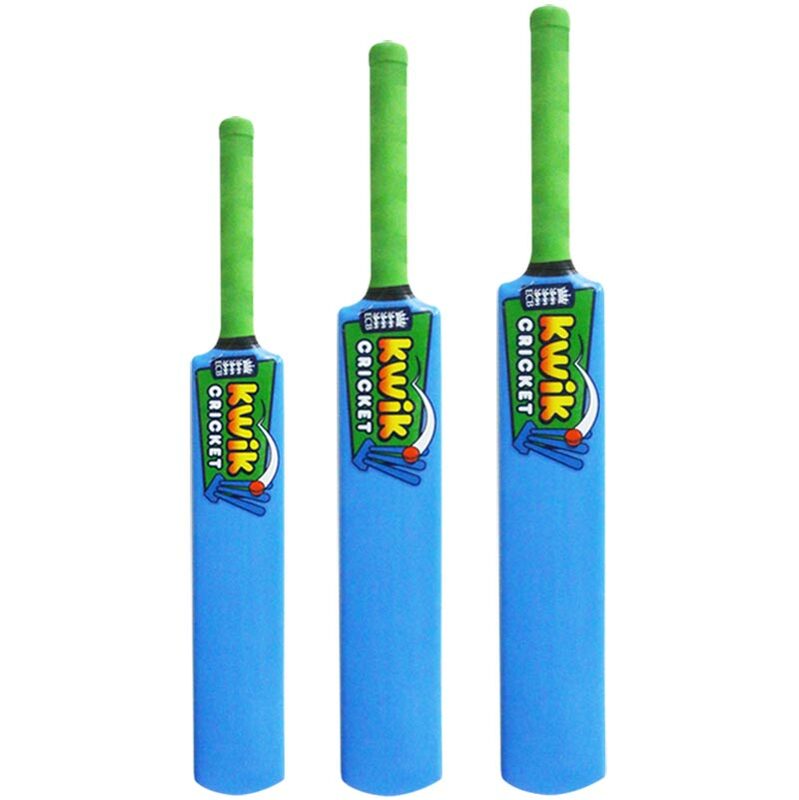 Kwik Cricket equipment is made from high quality moulded plastic. It is light enough for small hands yet extremely tough and hard wearing. Medium - 76.20cm (30in) equivalent to size 5, approx age 9-11 years. Small - 70cm (27.5in) equivalent to size 3, approx age 6-8 years. Kinder - 62cm (24.in) equivalent to size 0, approx age 3-5 years. I bought this bat for my daughter as she has started playing cricket, she absolutely loves it, it's the perfect size for her. This bat is great, my 6 year old loves it. It's a good size without being too heavy. Bought this bat for my 7 year old Grandson.He has just started coaching with a local cricket club and having his own bat has made him so proud! He took the bat to bed with him! The bat is light and the rubber grip helps his small hands. Bought for my 5 year old son as a small lightweight bat to introduce him to cricket. Very pleased with the purchase (as was my son!). Very reasonably priced too! Excellent product, used by coaches and loved by father and son. Value for money and first class purchase and delivery. This is an excellent product at a very good price. The size and weight are perfect for my 5 year old grandson. Brought these for my Granddaughter as she starts playing Quik cricket at school this year. Excellent product, would definately recommend. I purchased the Gray Nicolls Kwik cricket bat for my 5 year old son, who has just joined a club and started to learn how to play cricket. We use it to practice in the park and garden. Unlike some light-weight plastic bats, this is good quality, feeling solid but still very light.The size also is idea for him and myself to use. A great starter bat, would recommend. I had the standard Kwik cricket set with the size 5 bats and excited by the ashes my children wanted to play but the bat was far too big. Getting the smaller sizes has helped their enjoyment and ability to crack bat on ball enormously. Delivery was wonderfully swift and we've had great fun emulating Joe Root and Co in the back garden. The size 2 bat has been perfect for my six year old. Just bought bat, tee and ball for my 3.5 year old son. Perfect for him. Loves to hit ball from tee with great success which promotes his enjoyment. I am a cricket coach and PE teacher and think that kwik Cricket is the best intro to cricket for young players, even at 3 years old. Great bat for a young beginner, my Grandson's game has come on in a matter of two weeks since it's purchase. Well satisfied with it, and also newits service from order to delivery. Thanks Nevitts again delivered to me in a very short timescale, well packaged and order exactly accurate! The bats are just the right size for our junior teams. 5 out of 5 Does the job nicely! The thud of plastic on plastic doesn't quite have the appeal of leather on willow, but they seem to like starting chilren off on these nowadays, so who am I to argue?